The 2018 Range Rover Evoque luxury SUV has the capability you expect from an SUV with the luxury and performance you expect from Range Rover. Whether you need room for passengers or plenty of space for cargo, the Evoque offers both. Land Rover Colorado Springs currently has four Evoque models for you to choose from, including the 2018 Range Rover Evoque pictured above. This the SE Premium trim level presented in an eye-catching red exterior color and with an exciting variety of features. Enjoy the many benefits of the Climate Convenience Package, Chrome Wheel Lock Pack, and Driver Assistance Package. Plus, the power lift gate allows easy access to the spacious cargo area. The 2.0L Turbocharged engine pairs well with the efficient 9-speed automatic transmission which together provide an estimated 22 mpg city and 29 mpg highway! Visit Land Rover Colorado Springs today for a test drive. 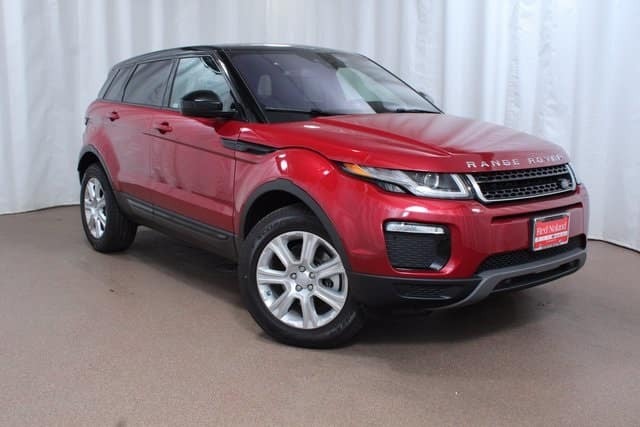 Since we have several to choose from, you can find the Evoque that is perfect for you!